The world has something to say when a young girl looks to a classmate, witnesses her hardships, is more than willing to help and actually creates a movement that exceeds her original intention. I even think the word “intention” says a great deal. We all have the best intention when stepping out to go to our 9 to 5. But how many have seen another struggle to pay for gas, warmth and the vital necessity of nourishment to keep others moving to see a brighter day? I hail this young lady, a red carpet should be laid out whenever she exits her home for she is a Queen. Today we would like to recognize a young woman whom is changing her community one giving hand at a time. We introduce Zuri! F: Tell us how Zuri came to want to help her classmate whom was struggling with basic school necessities? Zuri’s Circle: Zuri is a very giving young girl. She didn't like seeing her friends go without the basic things that she was able to obtain and she wanted them to have things so that they wouldn't get made fun of or talked about. F: How did this idea spread and become a movement in your community? Zuri’s Circle: It was simple it started with the idea, once the idea was created we decided that we could start by visiting some schools so we reached out to a few in Phoenix, AZ. that is where it all started. Then we started talking to people we knew and getting our friends involved and it took a life of its own. F: If I read correctly, in 2014 Zuri's Circle became a 501C3 officially, since then have you seen this impact her peers, teachers, school board and Zuri herself? ZC: 2012 we became an official non profit. We have seen such a difference in how we can help students in the school with the support of principals and teachers and schools that we assist. Her impact is such a good one because we are making it comfortable for families to ask for help without being embarrassed. Because we reach them in a familiar and comfortable setting. F: I am astounded, 2012! That is simply amazing! F: As you strive to be more than a non profit, seeing the youth be so active in the community, it has been stated that growing the movement into something bigger is ideal, tell us more about the Jr. Speaking League and the Adopt a Classroom movement? ZC: Our Jr Public speaking is a way to help our youth be more comfortable speaking, but also expose them to where proper speaking can take them. Like news, radio, voice overs, television and more.Our adopt a classroom program gives us the opportunity to reach youth in their environment, helping to meet the needs of what they need to succeed in the classroom and in the community. We teach them that they can be powerful with their words, their learning, how they engage in the community, with their teachers etc. and by coming into the community we are able to truly see what the needs are. We are creating a movement for youth to Be Powerful and that can be done by becoming Doctors, Lawyers and teachers. Yes sports are great but the youth can be so much more than just athletes. F: We totally agree. Organized sports are always a plus in schools, but can you imagine the organizing of a club that reaches the community to build and what achievements that entails. Well, actually that is exactly what you are doing! F: How have you witnessed these children thrive in the classroom since you have become an integral part of their successes? ZC: We see the children wanting to do more to help in the community, be more open to speak with us about issues they face. We create a level of respect between ourselves and the students. This is something they will remember and carry on with them. F: By providing the tools for youth to become empowered, do you see the trickling down into the community whom are not directly connected to Zuri's Circle? ZC: Yes because if we teach the children to love their community and give back you find they will volunteer more, tell you about families they know struggling in silence. They are what keeps the movement of Zuri's Circle moving and thriving. They are putting worth and power to their names. F: What are some of Zuri's current goals to help implement her vision and mission? ZC: We are steadily striving to get a building so that we can create more programs like a cooking program that will serve the community, engineering, art and so much more. Our students are losing these things in school and we would like to bring them back. And each program will serve a purpose within the community. 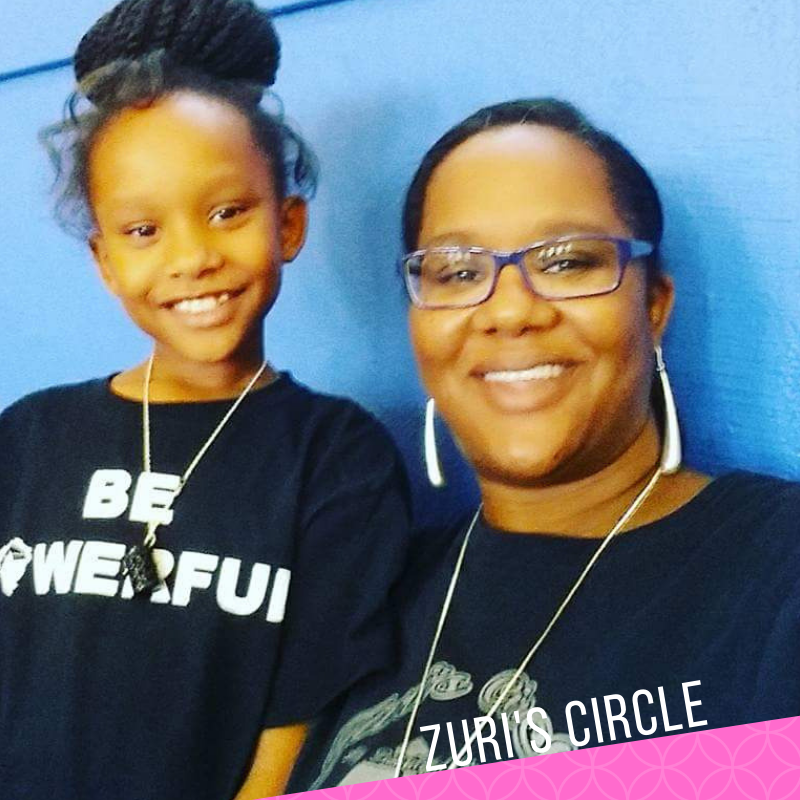 F: Stepping out on a whim to help another without feeling out of place, how have you seen Zuri grow into an empowered young woman, from a mothers standpoint? ZC: Wow! As her mother I have seen her grow into an amazing young lady that truly care about others and understands the importance of giving. Yes she feels out of place at times because she is not the typical child that is playing outside, she is inside working on how to grow her business and help more individuals and what we can do to grow. F: How can others help in your mission? Donations? Social Shares? ZC: We truly could use everyones help by spreading the word of Zuri's Circle Mission. Individual should know that our organization gives 100% of our donations back into the community. We need help to reach our goals to obtain a building, a moving truck, and to purchase property to create a small farm to feed families and to build homes to temporarily house individuals facing homelessness. We can all "BE POWERFUL" by supporting our youth who are trying to change the world. F: In one word what does Femwinism mean to you? In support of Zuri’s mission, you can make a tax deductible donation @ http://www.zuriscircle.org/ or the AmazonSmile Link that supports her cause.